Paleo is an exploration game from Squale Games, but you move pieces by flicking them across the board, trying to knock off your opponent’s mercenaries and explorers. 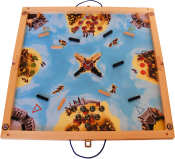 It can also be played 3 or 4 players. The game includes rules for using the pieces to play a dozen other games, including some type of hockey and billiards.